Like all of our manufacturers, Fleetwood RV is a very family focused RV manufacturer. 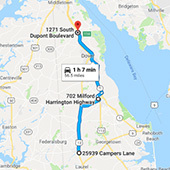 With over sixty floor plans to choose from, We at Delmarva RV Center will help you choose the perfect high-end RV to suit your family’s needs. You deserve it and we want to provide it for you! Fleetwood RV offers RV models from Class A Diesel to Class C gas RVs. We are proud to offer Fleetwood RVs and we are excited to match you with the perfect Fleetwood RV to accommodate your family.